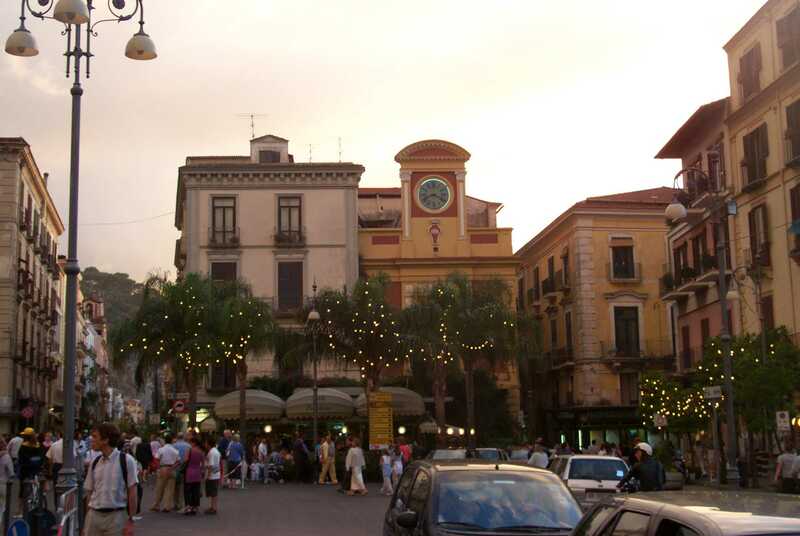 The town gives its name to the Sorrento Peninsula, a great area extended from Vico Equense to Massa Lubrense. This area, thanks to its geographical shape, suspended between the green hills and the blue of the seas, is from the time immemorial a great attraction of the southern Italy. 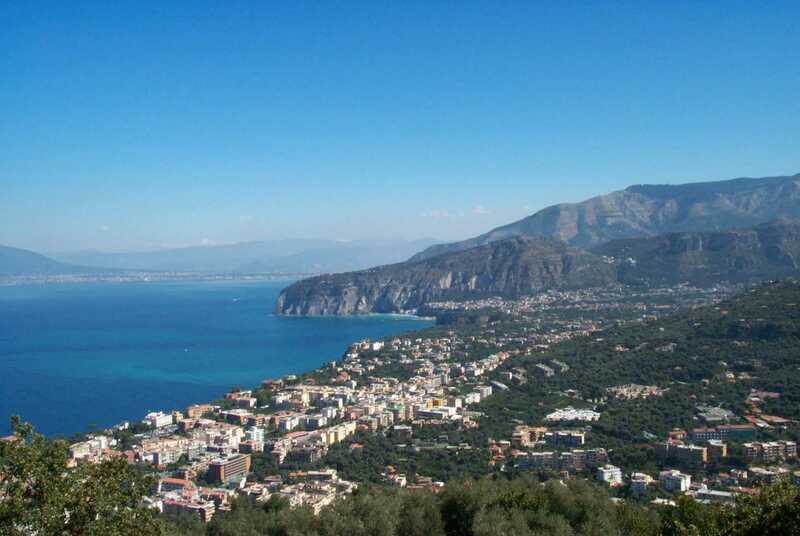 With its almost twelve thousands accommodations in over 150 accommodations facilities and over ten extra accommodations – among camping, bed & breakfast, residences, hostels, holiday villages and thirty farm holidays – the Sorrento coast is one of the most popular destinations of the entire Campania region. It is also the ideal destination for Italian visitors and foreign tourists, that want to plan excursions to Capri, Ischia, Pompei, Amalfi, Positano, Ercolano, Paestum and Vesuvius, places located at a distance of 50 Kilometres. 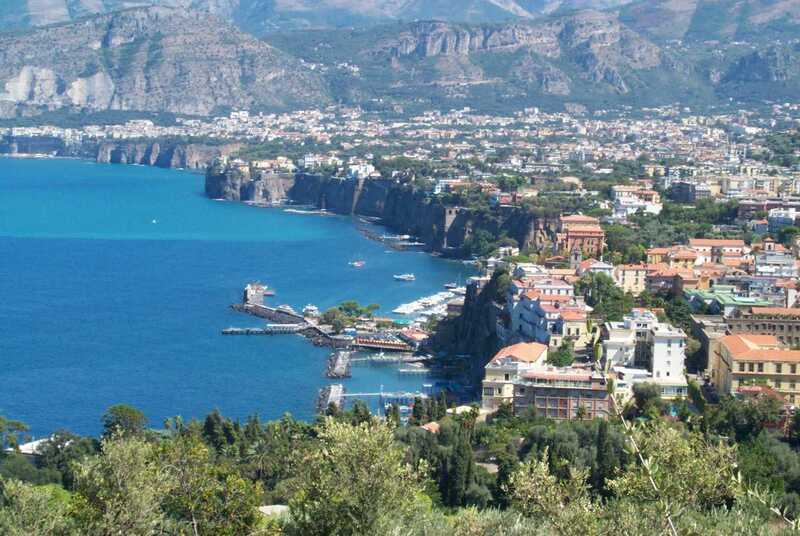 Sorrento was first a Phoenician colony , after that it became a port frequented by Greeks for the commercial activity with Naples and with others southern cities. It was named by Greeks “Syrenusion” or “Syreon” that means Siren’s land, the Sirens were the mythological creatures half woman and half fish, that Homer told in his famous work “Odyssey”. These creatures with their song could fascinate the sailors at the point they were ready to die reach them. After the rule of scans and Sannites it was submitted by Romans. The Romans appreciated so much the beauties of this place that during the imperial period it was elected an holiday destination of patricians, as the numerous villas witness. It was the native country of Torquato Tasso. From a long time Sorrento has exercised a particular charm which has attracted poets and literary men like Goethe, Lamartine, Stendhal, De Bouchard, Byron, D’Annunzio, Ibsen, Douglas, musicians like Rossini, Liszt, Mendelssohn, Wagner, painters like Pinelli, Fernet, Lindstrom, photographers like De Luca and the brothers Alinari, directors like De Sica, Gallone and Mastronardo. Among the famous visitors of Sorrento we can remember also Enrico Caruso, Giacomo Casanova, Scipione Breislak, Marion Crawford, Charles Dickens, Helman Melvill, Friedtich Nietzche ed Axel Munthe. This coasting town was included in the eighteenth century among the main destinations of the Ground Tour, a journey among the most significant Italian cities, that was made by the foreign intellectuals who wanted to study in depth the Italian history, art and culture. The Basilica of Saint Antonino is dedicated to the Patron Saint and was built around the year 1000 with a typical basilica structure, with a nave and two aisles, then it was restored and rebuilt between the XVIII and the XIX centuries. The structure preserves, by the way, paintings of 1600, fragments of an ancient majolica tiled floor and a remarkable example of Neapolitan crib of 1700, which was attributed to the students of the Sammartino School with statues which were dressed up with clothes realized with precious fabrics and enriched with precious laces. In a crypt below is located Saint Antonino’s grave. He was born in Campagna, a town near Salerno, came to Sorrento after a period in which he lived between Castellammare di Stabia and Faito Mount, and here died on 15 February 471. Among the miracles which were attributed to him, it’s important to remember, when he saved a child who was swallowed by a whale. This fact explains the presence of two cetacean bones in the hall of the basilica. There was a deep bond between the Saint and the sea and its inhabitants as the collection of ex votos given to the church by the sailors escaped the shipwrecks, witnesses. In the cathedral of Sorrento couldn’t lack the examples of the local art, famous in all Italy: the wood intarsia. 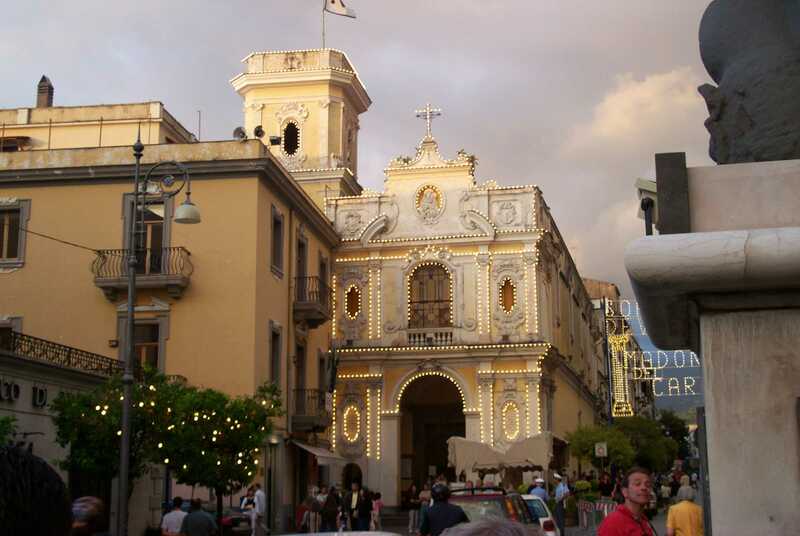 The cathedral of the town overlooks the street Corso Italia the main road of the modern Sorrento. It was built at the beginning of the fifteenth century with a romantic style and later it was restored several times until the restoration of 1924 during which were rebuilt entirely its front. The church, in addition to the baptistery where was baptized Torquato Tasso, maybe the most famous citizen of the town, contains a great number of paintings of the Neapolitan School of the eighteenth century and is characterized also by a grand campanile. The Sedil Dominova is a refined monument, built around 1450 and perfectly preserved, it was the place where the representatives of the local nobles met to discuss about matters related to the political and administrative life of the city. The only witness in all region Campania of the ancient aristocratic meeting point is that one of Dominova with an open loggia, surmounted by arches with a square base and that is closed on the two sides by two balustrades and a majolica tiled dome of the seventeenth century. Very interesting are the frescos of the seventeenth century which represent the architectonic perspectives. The inner small lounge preserved the marble inscriptions that now are at the museum Correale di Terranova in Sorrento. In the area opposite Sedile Dominova once stayed a small fountain, from this fountain was given to the square the name “Schizzariello” that means a small squirt of water. Saint Francis’s convent is formed by three buildings: the church, the convent and the very famous cloister. The church was built in the XVI century in a Baroque style, but with a front in white marble that was built in 1926. It preserves important works as the wood main door, representing Saint Francis with the Crucified. Another statue of the saint, in bronze, in a modern style, realized in 1922 by the sculptor Alfiero Nena, is visible in the square, opposite the church. Next to the church there’s the splendid cloister of the fourteenth century that was found in the VII century and that today is still inhabited by Franciscan friars. The building has a rich variety of architectonic styles melted together to form one work, an ideal setting of the art exhibitions, festivals, concerts and events. You can reach Marina Grande, the ancient harbour, trough a road that goes downhill, with large steps. This road has origin from the end of the street “Sopra le Mura”. After few steps you reach to the gate of Marina Grande which preserves, despite the successive restorations, the typical Greek structure and it’s dated around the IV century B.C., from this gate entered the Turkish pirates, sacked Sorrento in 1558. Going beyond this gate you are behind a typical fishing village, represented by a fusion between the Moorish architecture and the real local style. From this combination arise architectonic forms, bizarre and picturesque like the houses, built in the tuff cliff and that are still inhabited. Here arises also St. Anne’s church, the patron saint of the village, was built at the end of the seventeenth century and later extended. On this beach, in a shipyard under the open sky were built the famous “Sorrento fishing boats”, a typical wood boat with a sail, these boats were long from 6 to 12 meters, easy to handle and reliable, unsinkable. 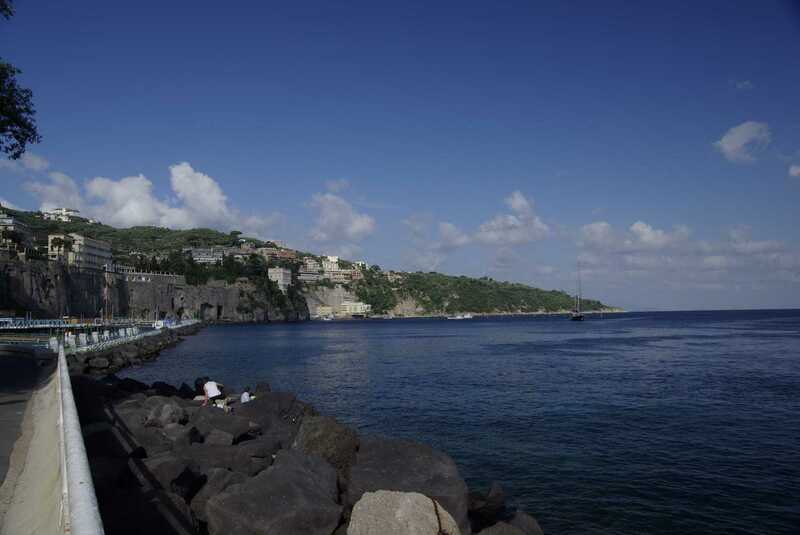 The mastery skill of Sorrento artisans was so great that the fishing boats were used by the fishermen of the Gulf of Naples and of the islands. Heirs of this tradition are the fishing motor boat that are built still today in Sorrento and its surroundings. The Correale Museum arose by a private institution, wanted by the brothers Alfredo and Pompeo Correale counts of Terranova, the last descendants of an old and aristocratic family of Sorrento. In their will they provided that the palace and their art collections, preserved in the villa Correale, constituted a museum entitled with their name. Walking along the rooms of this splendid residence you can admire precious furniture, refined European and eastern porcelains and rare Neapolitan and foreign paintings. The building is distributed on three floors, with a total of twenty four rooms and the loft that is used as an expository space. The art collections of the museum Correale present a wide range of Neapolitan painting and decorative art from XVI to XIX century and of foreign painting. It also preserves an interesting collection of European clocks and one of the most prestigious collections of Chinese, European and Neapolitan porcelains of the XVIII century. For further information visit Museo Correale di Terranova. The museum, located in the old town, in a building of the eighteenth century, in rooms with fresco vaults and with the ceilings faced with wallpapers hand painted, presents a selected and rich collection of furniture and objects made by the inlayer masters of Sorrento for all the XIX century. The display highlights technical and decorative aspects of the single schools and artisan workshops. The adjacent display of paintings of Italian and foreign artists, of vintage photos and prints, allows to reconstruct the nineteenth century image of the Sorrento coast and of the historical and environmental context in which the local production of intarsia developed. The progress of the manufacture techniques, the documentation of the used materials, the study of decorative themes and of the planning details which value the design of the intarsia products and offer the occasion for other so many sections. 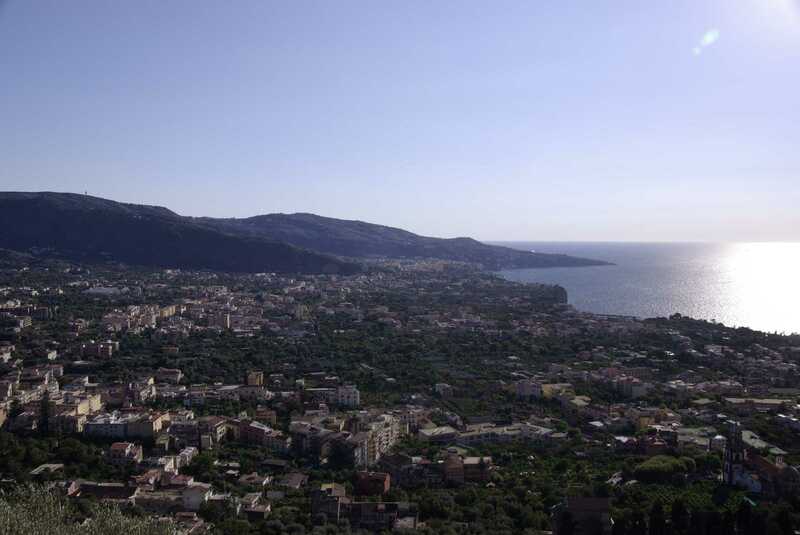 Capo di Sorrento is halfway between Sorrento and Massa Lubrense, reachable also by bus, has got the Regina Giovanna Beaches and the archaeological site of the villa of Pollio Felice. To reach this area you have to go along a narrow street, shaded by olive and orange trees, with the walls covered by ivy, which goes down along the ramp degrading to the sea. The cliff is dedicated to the queen Giovanna Durazzo d’Angiò, who, according to a legend, came to lower herself into this sheet of sea. Almost all the area is occupied by ruins of a great Roman villa, that belonged maybe to the patrician Pollio Felice, built at the time of the emperor Domiziano (81-96 a.C.) and was also sung by the Latin poet Stazio in his poem “Silvae”. Going on you can reach the “Solara” a expanse of cliffs corroded by the sun, a summer destination of hundred bathers. Marina Puolo is a suggestive seaside village, it counts today about 150 inhabitants and a territory divided into Sorrento and Massa Lubrense. Its story is that one of the old fishermen, that were busy repairing nets and inquiring that sheet of the sea, part of the nature reserve of Punta Campanella, a protected area of notable esteem for its biodiversity. The village located behind the big beach is risen above by an old sighting tower of the pirates. The name “Puolo” derives from a distortion of the latin Pollius, name of the Roman patrician Pollius Felix, owner of a majestic villa, which stood very close. Puolo area is involved with a recovery and protection project concerning the tourist field. This project has been made and continued by an association constituted among the inhabitants of the village.